A winter soup to welcome the New Year and re-open the blog, which has been virtually on hold while Healthy Eating for Life got launched. Not a great “looker” this soup, so Madame La Photographe added a touch of parsley. Making this is a lovely long process, something to do on a cold rainy afternoon–like today. 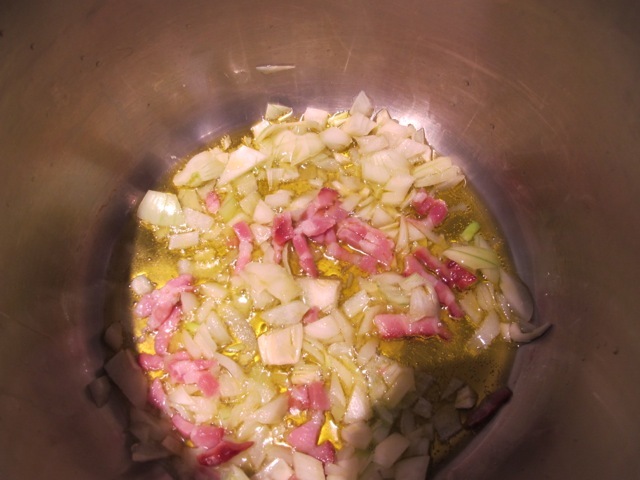 Not a lot of work involved–most of the time the soup chugs away on its own on top of the stove . Adapted from the inimitable and recently deceased Marcella Hazan, it sometimes features cooked sausages*–not here though. Meredith is on a short de-tox regime–though she said not to worry about the ounce of smoked bacon that helps deepen the taste. I’m writing this while it chugs. 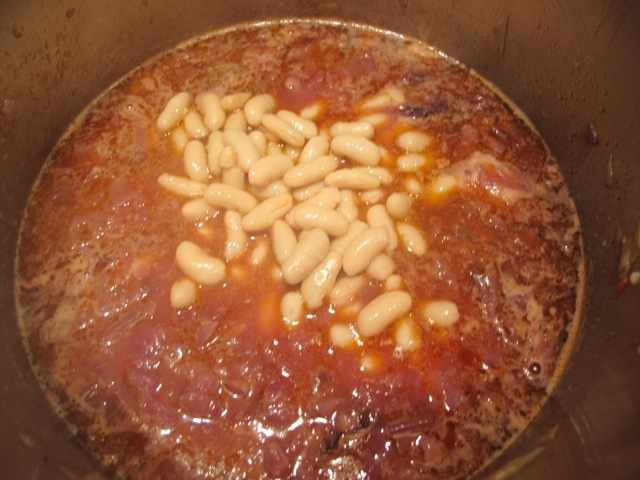 500 gms/18 oz cooked white beans (jar or tinned [canned]) drained–a rough figure depending on the tin/jar. 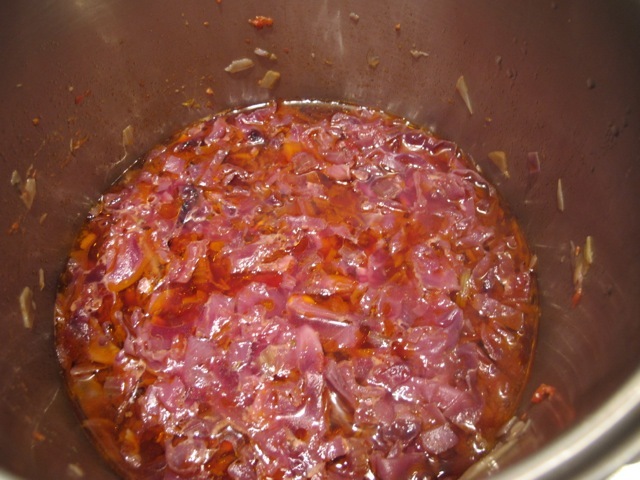 Heat the oil in a large saucepan and sauté the onion, garlic and bacon until they start to color–about twenty minutes. 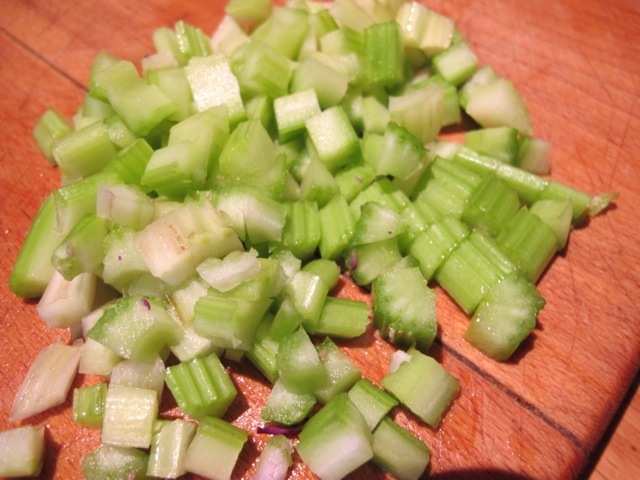 Add the tomatoes, cabbage and celery and mix thoroughly. 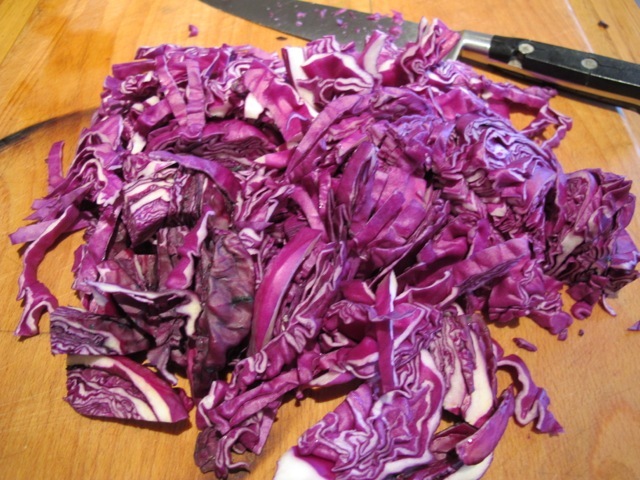 Allow the cabbage to soften completely–about 30 minutes. 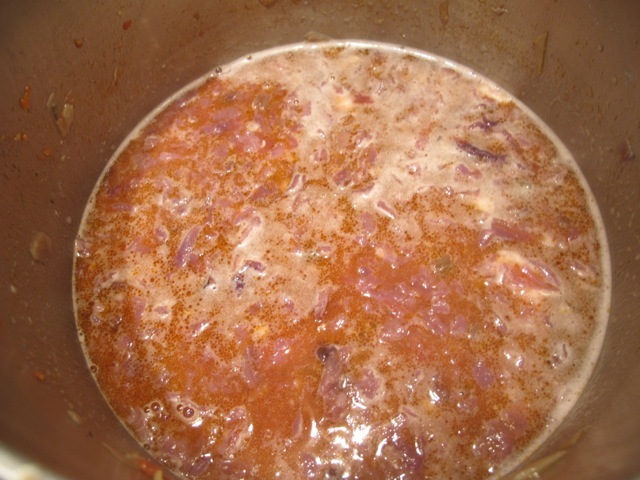 Add the salt and stock, stir in and cover the pot. Cook this on a very low heat, this is the chugging stage (you’ll hear it chugging! ), for two hours– longer if you like! Then add half the beans–puréed–and stir them in. Cook on for ten minutes to heat them through before adding the rest of the beans. Stir them, cover the pan and let it chug-chug for 10 to 15 minutes longer. Now the authentic Italian bit! 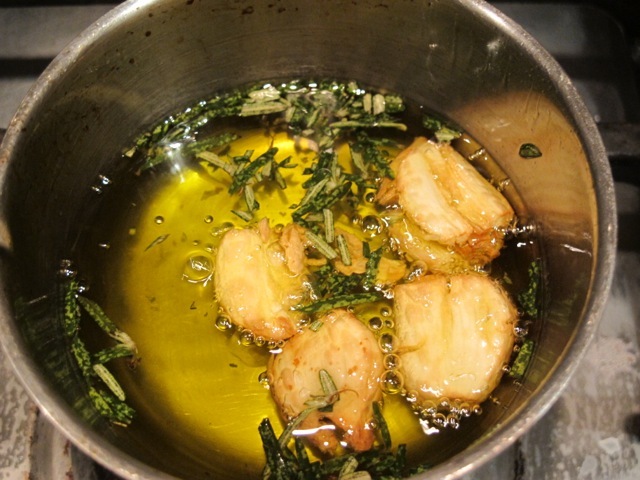 Lightly color two peeled and crushed garlic cloves in four tablespoons of olive oil. Off the heat add a teaspoon of chopped fresh rosemary. 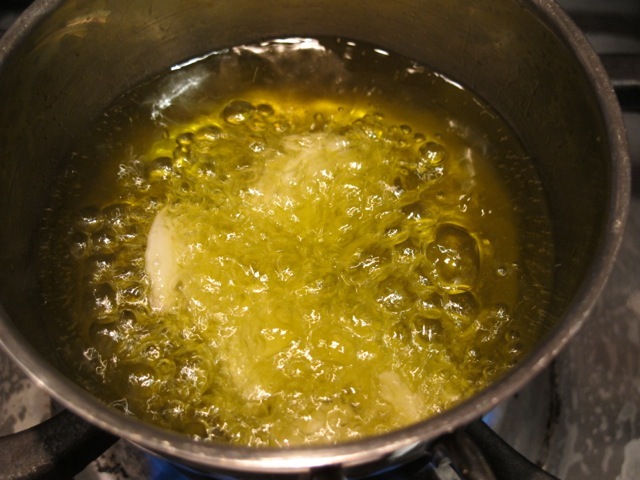 Pour the oil through a metal sieve into the soup and let it absorb the flavors while it cooks a further ten minutes. * The sausages, if using, are browned in a separate pan and added, cut into chunks, after the main two hour “chug”! …sounds really, really good, Robin. I do have one question, though. The recipe states “3 medium tinned tomatoes–chopped” Do you mean 3 medium tins of tomatoes — or 3 medium tinned tomatoes? Three medium toms not tins, Chris. Thanks I’ll make it clearer. Looks delicious. This appears to be a cousin to your White Tuscan Bean Soup which is a favorite in this household. Neil and I both love red cabbage so this soup is officially on our menu for this weekend. Can’t wait to try it. Love the olive oil infusion. Looks really interesting. Is it 3 med. tomatoes, or 3 tins? Just to be sure. That’s quite a soup, Robin. Thank you! It reminded me of my childhood in the old country. Mum used to make a similar one but with white cabbage instead red. There were no “tinned” tomatoes and only the whole home preserved were available during the winter months. The beans were always dry and had to be soaked overnight and cooked the following day. As you can well imagine there were nothing “instant” and required a bit of planning ahead. “As you can well imagine there were nothing “instant””–and tasted all the better for it, Odette, I’ll wager. Simple perfect: I adore it!!! 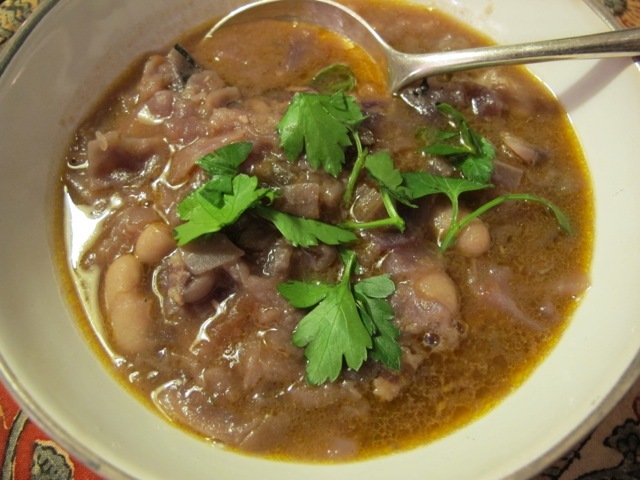 I always use my slow cooker crockpot to make my organic white dry beans and they cook wonderfully. Start them first thing in the morning and they are done in about 5 hrs! I use the beans as a side, or in homemade soups. I buy uncured bacon (no nitrites or nitrates) applewood smoked, so no worries there. The red cabbage “chugger” sounds marvelous! On another note…I kindly called Books for Cooks this morning since I saw no account info coming from across the sea regarding London book signing and new book. A good guess! Maryanne found my book lounging upstairs, and with a small glitch corrected, it is finally on its way…Many sincere thanks to Maryanne! (And sometimes it helps to be just a little pro-active). I am going to have to give this a try sometime. It looks very good.